Kellogg Community College is partnering with area employment agencies to host a job fair this week in Coldwater. 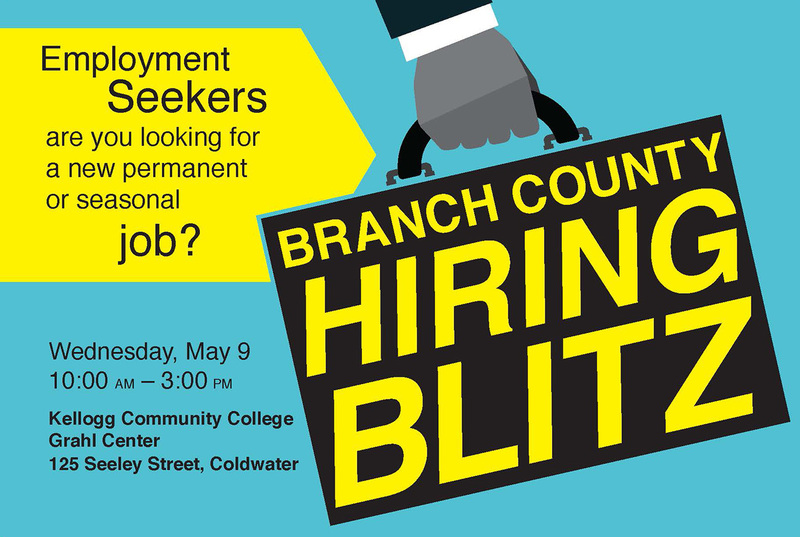 The Branch County Hiring Blitz will be held from 10 a.m. to 3 p.m., Wednesday, May 9, at the KCC Grahl Center, 125 Seeley Street, Coldwater. Michigan Works! and Branch Area Careers Center, along with KCC, will gather employers at the job fair, with a focus on helping college students, graduating high school seniors and those looking for a change in careers. Some employers scheduled include American Axle, FireKeepers Casino, DENSO Manufacturing Michigan, Pines Behavioral Health Services, The Laurels nursing and rehabilitation centers, Clemens Food Group and other manufacturing, retail and health care businesses. Michigan Works! will be hosting an event before the job fair from 8 a.m. to 5 p.m., Tuesday, May 8, to help people with resumes and navigating through interviews. The Blitz Prep for Employment Seekers will be held at 210 Vista Drive, Coldwater. “Branch County has so much to offer to the community and working with the Coldwater Area Chamber of Commerce, Michigan Works! Southwest, Branch Area Careers Center and their staff demonstrates their passion in the community and building a positive workforce,” Grahl Center Director Shari Deevers said. For more information about The Blitz Prep, call 517-278-0200.